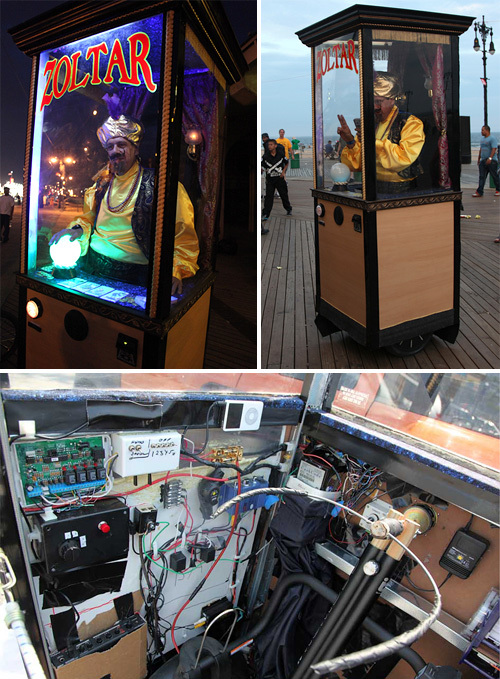 Rolling Zoltar Fortune Telling Booth Costume Successfully Predicts A Real Use For A Segway | OhGizmo! It’s not Halloween just yet, but I’m pretty sure I know what Jonathan Gleich will be wearing this year. His truly impressive Zoltar fortune teller costume relies on a mostly hidden Segway to make it appear as if the booth is rolling around on its own. Now it won’t make anyone Big, but it did manage to take 1st place in the motorized division of the 2009 Coney Island Mermaid Parade, and will probably continue its reign of contest winning terror as October 31 gets closer. And for the record it’s no where near as impressive as my Big-themed costume, a 12-year old boy living inside a 30-year old guy’s body, which I never actually take off.